Shane Lowry won the Irish Open in 2009 when he was still an amateur. 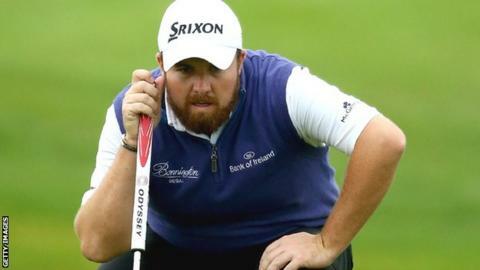 A six-under-par round of 65 helped Ireland's Shane Lowry take the lead at the halfway stage of the Wales Open. The 27-year-old 2012 Portuguese Open champion moved up six places to lead by a shot from overnight leader Joost Luiten and Belgian Nicolas Colsaerts. Stephen Gallacher (+6) will have extra time to prepare for Gleneagles, but Thomas Bjorn (-2) and Lee Westwood (level) both made the cut. "I'm pretty happy," Lowry said. "I've never, ever done well here before so to be leading after two rounds is nice. "I felt like coming here I could give it a go this week." European Ryder Cup captain Paul McGinley will be pleased with the form of Donaldson a week before his team take on the United States at Gleneagles. The Welshman had four birdies in a flawless round of 67, and has carded just one bogey in his two rounds. Gallacher was one under in his second round, but that was not enough to rescue his weekend after a traumatic opening round of 78. "Yesterday was quite tough," Gallacher admitted after a round containing two birdies and one bogey. "I played nicely again. Today there wasn't quite as much wind so it was easier to get close to the pins and I did that on a few occasions and I was able to capitalise and I'm happy with the position I'm in. "I've had two good days and I'm happy, but I'll have to make the best of the weekend to catch guys at the top, but it's possible I just have to keep playing as well as I have been. "It was tough to get going and get my head around it but today was a lot better. I was maybe trying a wee bit too hard yesterday and still thinking about next week." Westwood was happy that a battling performance ensured he would have two more rounds to get his game into shape for Gleneagles. Former Ryder Cup hero Philip Price - who famously beat Phil Mickelson in the final day singles when Europe beat USA at the Belfry in 2002 - shot a five-under-par 66 to join Donaldson in a tie for 10th place and give home fans more success to cheer. However, Italian Edoardo Molinari's superb round of 63 was the pick of the second day performances, lifting him into a tie for fourth place on seven under.